This rechargeable LiFePO4 battery pack TB12225F-S108A support Bluetooth communication function. Through Android and IOS APP, can read the battery status and information. Especially due to the Android system’s openness, different smart phone manufacturer will have their own different Bluetooth hardware version and customized feature Android systems. It is necessary for the customer to confirm whether the phone is compatible for the APP. "Standard Charge" means at 25±2℃ charge to limit voltage with 0.44C constant current, then charge with constant voltage until current less than 0.02C. "Quick Charge" means at 25±2℃ charge to limit voltage with 0.66C constant current, then charge with constant voltage until current less than 0.02C. "Standard Discharge" means at 25±2℃ discharge to the cut-off voltage with 0.66C current. "Quick Discharge" means discharge with 0.88c withstand 30 mins. 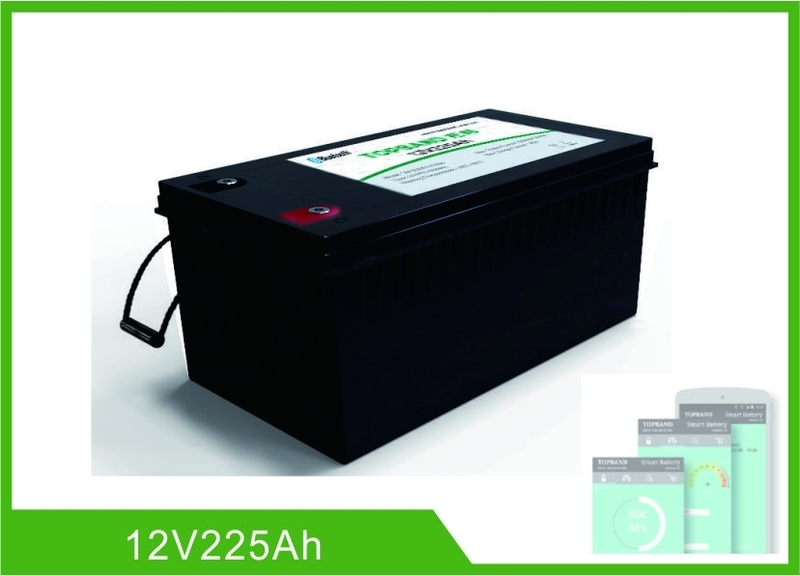 4.1 Rated Capacity 225Ah Rest for 1 hour after fully charged, then discharge with 0.33C current until the battery reaches the discharge cutoff voltage. Repeat above process for three times, if the discharge time is not less than 180 minutes, you can stop and define the Discharging current*time value (Ah) as battery capacity. Over current release method 8s after cutoff the load. ♦ Based on the character of cell, proper environment for transportation of LiFePO4 battery pack need to be created to protect the battery. ♦ Battery should be stayed in the warehouse 15℃～35℃ where it’s dry, clean, shade, and well-ventilated. ♦ The battery should be stored in 50% SOC during transportation. ♦ The battery need to be charged every 6 months if out of use. ♦ Keep the battery against dropping, turning over and serious stacking during loading. Please read and follow the specification and caution remarks on battery surface before use the battery. Improper use may cause heat, fire, rupture, and damage or capacity deterioration of the battery. SHENZHEN TOPBAND BATTERY CO., LTD. Describes is not responsible for any accidents caused by the usage without following our specification. ♦ The battery must be far away from heat source, high voltage, and avoid to be exposed in sunshine for long time. ♦ Never throw the battery into water. ♦ Do not put the battery in a charger or equipment with wrong terminals connected. ♦ Never connect the positive and negative of battery with metal. ♦ Avoid excessive physical shock or vibration. don't hit, fall, stamp on the battery. ♦ Without the permission of the manufacturer and guidance, forbidden to remove or to assemble the battery. ♦ Do not use the battery mixed with other different manufacturer, type, or model batteries. ♦ Keep the battery against high temperature. Otherwise it will cause battery heat, get into fire or lose some function and reduce the life. ♦ When battery run out of power, please charge your battery timely (≤15day). ♦ If battery emits peculiar smell, heating, distortion or appears any abnormity during working or storage, please stop using and take it out from device. ♦ If the battery leaks and get into the eyes or skin, do not wipe, instead, rinse it with clean water and see doctor immediately. ♦ Please far away from children or pets. ♦ Do not put disuse battery into a fire or water. ♦ Series connection is prohibited. 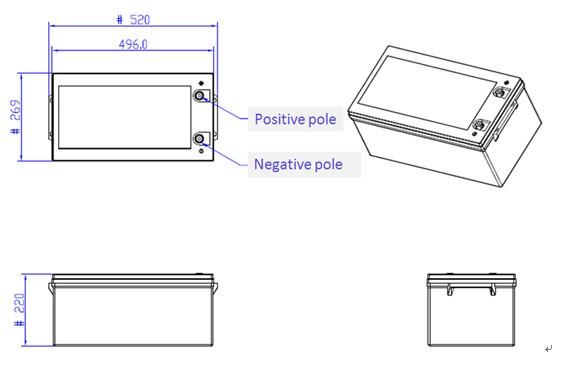 ♦ Parallel connection of this battery pack is allowed under condition that voltage difference ≤0.2V (fully charging each battery before parallel connection is suggested), parallel numbers ≤4 groups, and operated by professionals.